With Rohan Dennis setting the new hour record at 52.49km a few weeks ago, beating Matthias Brändle’s record of 51.85km that was set in October last year by more than 600 meters, a flurry of activity began in the pro-cycling world. The Dubai Tour was the peloton’s first trip to the Middle East of 2015 and was ran between 4-7 Feb in some amazing scenery. Mark Cavendish won the overall GC by winning the final stage, a fast, flat 128km stage from Dubai International Marine Club to the Burj Khalifa. He trailed German John Degenkolb by four seconds going into the final stage but a 10″ winners bonus on the line at the finish was enough to ensure he won the GC with Degenkolb in second and Movistar’s Juan Jose Lobato – winner of Stage 2 at the Tour Down Under – in third. Sky’s new sprinter Elia Viviani came second in the points competition with the victory also going to Mark Cavendish, who’s Etixx-Quick-Step dominating the race from start to finish. The Tour of Qatar, also in it’s second edition, was ran on the 8-13th Feb and provided Etixx-Quick-Step with their second victory of the season as Nikki Terpstra won the GC by 6″ from Tinkoff-Saxo’s Maciej Bodnar and “9 from Katusha’s Alexander Kristoff. The Tour was all about Kristoff though who scored three stage victories out of the 6 stage race, winning Stages 2, 4 and 5. Movistar’s Joaquin Rojas won the first stage and Bora’s Sam Bennett won the final stage. Terpstra netted a surprise victory in the time trial on Stage 3, beating Cancellara by 8″ and World Time Trial Champion Bradley Wiggins by 9″. This was Wiggins’ first appearance as Time Trial Champion since winning the Worlds in Ponferrada last September. The Tour of Oman is still underway with the final stage happening on 22nd Feb. Trek’s Fabian Cancellara is currently leading the GC by 4″ over Alejandro Valverde and 5″ ahead of Bora’s Patrick Konrad. Cancellara’s victory in an uphill sprint on Stage 2 is evidence that he is hitting his form for the classics that are due to begin over the next few months. As well as the big Middle Eastern races there have been plenty of smaller category races get underway and raced. The Étoile de Bessèges was won by Trek’s bob Jungels in the final time trial, whilst the 1.1 category Vuelta Ciclista a Murcia was won by Astana’s Estonian rider Rein Taaramäe. The Classica de Almeria, also a 1.1 race, was won by Mark Cavendish who continued his great start to the season. The Vuelta a Andalucia Ruta Ciclista Del Sol finishes on the 22nd Feb and is the first time Chris Froome and Alberto Contador have faced each other since the Vuelta a Espana last year. Stage 1a was won by Lotto-Soudal’s Pim Ligthart and Stage 1b by Movistar’s Javier Moreno in the time trial. Alberto Contador is now in the race lead and is leading Chris Froome by 8″. 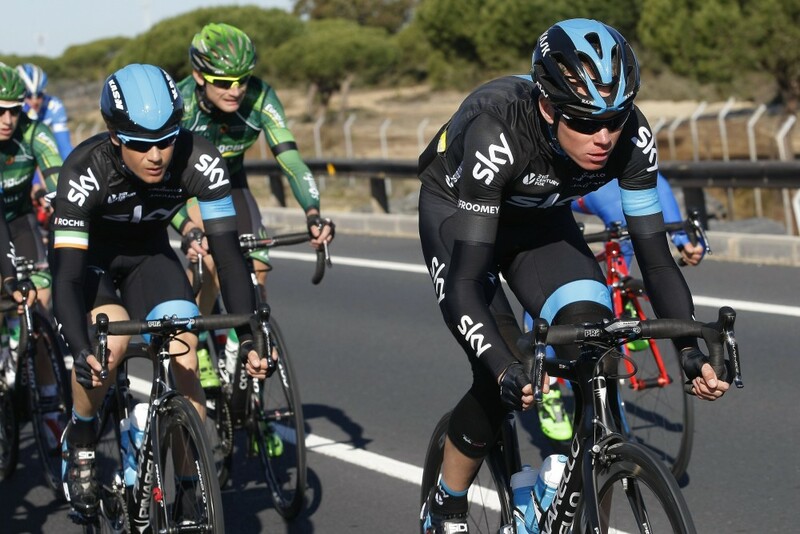 Froome is in fourth place in the GC with Bob Jungels in second and Benat Elorriagai in third.